I think that we over 50s stay young through new experiences. You say you’ve never been scuba diving? Jump in, the water’s fine. Never been to the opera? No time like the present. Recently, I crossed an item off my bucket list. I attended my first NASCAR race. Now some of you may be wondering why it took me 61 years to try the most popular spectator sport in America. My only defense is that I’m from New Jersey and there is no NASCAR in New Jersey, never has been. The closest racetrack for me is 90 minutes away in the Poconos. So unless you have family or friends who are fans, NASCAR is not on your radar in the state with the most roads per square mile in the nation. Only recently has a New Jersey NASCAR fan become a friend. My daughter’s boyfriend has been going to NASCAR races since he was a boy. So when he mentioned that he and his family were heading out to Pocono Raceway for the weekend, I expressed a desire to go along. 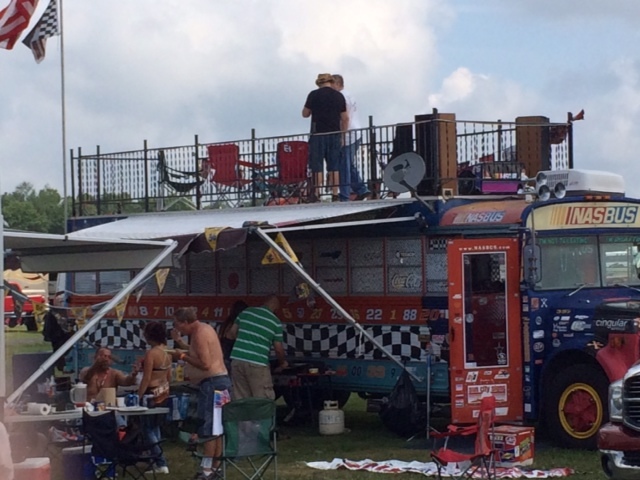 So my daughter and I got up at the crack of dawn on a Sunday morning and headed to Pennsylvania to meet up with her boyfriend’s family who had rented an RV and were waiting on the Pocono Raceway infield for us. If you’ve ever been to a horse race, you know that there is a center portion of the track that is usually green but not inhabited by fans. Car racing is a bit different. First, the track is about twice the length of a horse track and the infield is accordingly much larger. In fact, it’s large enough to accommodate hundreds of RVs. This is like the biggest tailgate you could imagine. Everyone brings grills, lots of food and unimaginable quantities of beer. In fact, everything about car racing is supersized. The racing is like horse racing on steroids; the tailgating makes football fans look like rank amateurs. Even the crowds, in excess of 200,000, are far beyond any other spectator sport. It took an hour, but my daughter and I finally reached her boyfriend’s RV parked on the track infield. The first item on the agenda was breakfast, and the bacon, eggs and sausage were among the tastiest I’ve ever had. We took a walk around and noticed RVs with satellite television and RV’s with rooftop terraces. We also noticed a lot of Confederate flags. Now I would expect to see the stars and bars south of the Mason Dixon line, but we were in northern Pennsylvania, about 150 miles north of Gettysburg in fact. So the presence of large numbers of Confederate flags was puzzling. The cars in the parking lot did not indicate that Southerners had driven north for the race. No, I found out that the stars and bars has become the flag of Redneck Nation. People who simply identify themselves as rednecks fly the flag, in some cases totally ignorant of its historical significance as a flag of slavery for African Americans. And as I looked around, the only people of color I saw were security personnel. There were also far fewer women than men. It seems that NASCAR is a predominantly white male pastime. Fortunately, I fall into that demographic, at least on paper. As race time came around, we all went to the fence separating the infield from the track and watched the cars whizz by. I have to say that I enjoyed the race itself and all the people we met were extremely friendly. I am glad that I went for the experience of it, just as I was glad that I visited the Guggenheim Museum the previous Sunday. I think that the overlap of customers at the two is probably quite small. But I’m glad that it includes me. 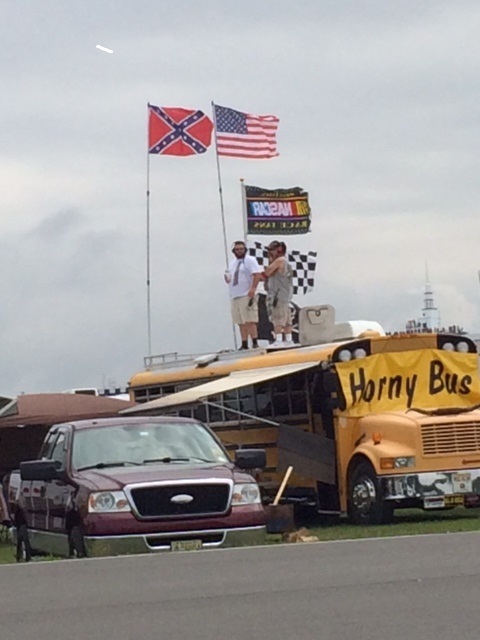 In fact, I would not mind attending another NASCAR race in the future. But this weekend, I’m going to the National Gallery.